I’ve joined the ranks of the completely obsessed with coloring books for adults! Have you? Remember those cool folders we doodled on in junior high with flair pens? Those are back but even better than before! These books range in complexity from very easy to very complex and a few of them even have hidden treasures you will find as you are coloring. I’ve updated this page to share my very favorite coloring books below. Please let me know via social media which one’s you adore. I first bought a few from Creative Haven including the Creative Cats Coloring Book (of course) being a crazy cat lady in training.. by Marjorie Sarnat. Steampunk Fashions is really fun too. The pricing on these on Amazon is about half the price or less than Hobby Lobby or Michaels so even with a 40% off coupon it’s a better deal on Amazon. These are my favorite coloring books that I continue to return to. I think pretty much everyone that has been bitten by the adult coloring bug has a copy of Secret Garden. Johanna Basford is the Queen and we all worship her inky illustration style. Hanna Karlzon’s books are so delicious! Dagdrommar was my first introduction to this Swedish illustrator. I couldn’t even wait until her books came to the US so I paid the extra shipping to have it direct from the Pen Store. It was worth it. Her books are bound like a regular hardbacked book and the paper is second to none. The illustrations tend to gardens, garden critters and whimsical scenes. All of her books are must have as far as I’m concerned. If you follow Hanna on Instagram you’ve probably already seen pictures from this gorgeous new book. Just pre-order it now. I probably have more pictures colored in in this book than any other. There’s just something really magical about Maria Trolle’s drawings and they are easy to figure out. The paper is SPECTACULAR! If you are familiar with Hanna Karlzon books, this paper is the same Swedish type including the bookbinding. This book still isn’t available on US Amazon so I checked Ebay, Etsy and finally located it on the wonderful free shipping book site Book Depository. You would never know how fabulous this book is by looking at this listing BUT I saw images from it on Instagram This is my first coloring from the book. It’s that really cool grayscale that makes it look like you are a fabulous artist. I love that! I received this GORGEOUS book from the author and have a flip thru on my social media channels. you can also see colorings from this little gem on Instagram here. 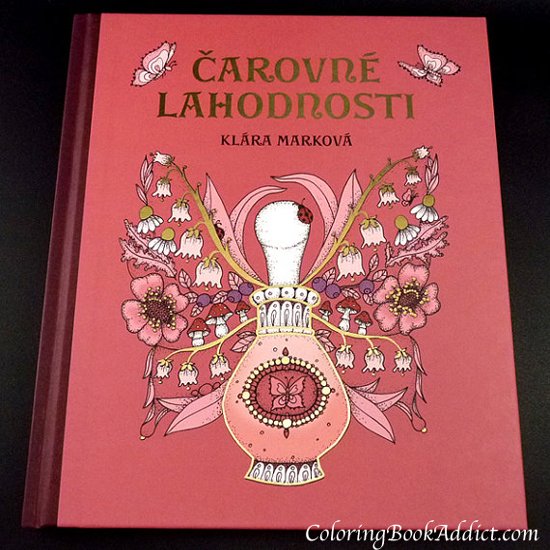 The book ships direct to you from the Czech Republic via her Etsy profile here. You are also able to order it on Amazon UK Here. Klára’s book reminds me quite a lot of the Swedish books from Hanna Karlzon and Maria Trolle that you know I love. If Amazon let me give it a 10 star review I would. This coloring book is perfection! It’s a real hardcover book that can sit on your bookshelf for years to be shared with your friends and family. I have recently thought what a wonderful keepsake this will be for my kids and grandkids to see gramma’s books she colored in all those years ago. While I adored her artwork, the CreateSpace paper on Amazon just didn’t do it justice. I was thrilled to discover that she sells her books along with a ton of her art in both digital download formats as well as all of her coloring books on beautiful thick paper on Etsy. I immediately ordered both and am thrilled with the quality. “Inklings 2” Click to order on Etsy. *Bonus* This coloring book comes with a free printable pdf version! When you are done with this coloring book, you can print out another to color again, free! Our lives become busier with each passing day, and as technology escalates, so does our access to work, obligations, and stress. Constant stimulation and expectation have left us burnt out and distanced from the present moment. “Now” has become something that happens online, not in the space and time that we physically occupy. Color Me Calm is a guided coloring book designed for harried adults. Art therapist Lacy Mucklow and artist Angela Porter offer up 100 coloring templates all designed to help you get coloring and get relaxed. Organized into seven therapeutically-themed chapters including Mandalas, Water Scenes, Wooded Scenes, Geometric Patterns, Flora & Fauna, Natural Patterns, and Spirituality – the book examines the benefits of putting pencil to paper and offers adults an opportunity to channel their anxiety into satisfying, creative accomplishment. Part of the international bestselling Color Me series, Color Me Calm is the perfect way step back from the stress of everyday life, color, and relax! Don’t forget to try Color Me Happy: 100 Coloring Templates That Will Make You Smile (A Zen Coloring Book) and Color Me Stress-Free! Once I starting gathering supplies and getting offline and coloring instead of Facebooking….. I also discovered Zenspirations books by Joanne Fink and then Zentangles and patterning.. Oh boy.. that’s a whole other level where you get to embellish the coloring books that these other artists have created for you. Of course you are going to need LOTS of fun supplies…….